Often, it’s the small things that make row houses special. Take away the architectural accents and you probably find yourself in a fairly basic, brick box which is why row houses have such a bad reputation for being boring. Well, we don’t like boring! Additionally, summer is the perfect time to add a little charm to your row house. If you’re lucky enough to have a front yard there’s a lot you can do. If you mix the types of plants and flowers you have, you can transition from season to season without ever having the front of your house look bare. Small ornamental trees like the Japanese Maple, Cascade Falls Bald Cypress, and Forest Pansy Redbud are perfectly scaled for smaller homes. A nicely pruned Holly or other evergreen will provide foliage year round. Just make sure today’s perfect little tree doesn’t turn into a monster that will fall on your house in future years. Many row house dwellers have street facing homes with nothing but a stoop and concrete sidewalk. You can still can add some nature to your facade with window boxes and container gardens. 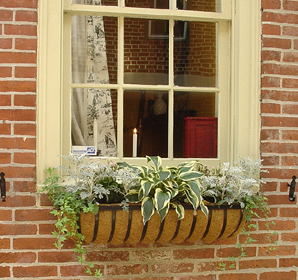 Window boxes can range from inexpensive wire baskets to elaborate wooden boxes. Because they’re small, you can experiment with different plants and flowers. If you have a black thumb don’t be discouraged, there are very hardy plants that require minimal attention, such as a Hosta. Minimal attention will keep it fairly lush and Hostas come in a variety of colors. Ivy is another nice choice as long as you watch that it doesn’t attach itself to your walls and cause damage to your masonry. As a former plant-killer, I have found that if you take the little stakes that come with the plants and use them to make a watering schedule, it works out fairly well. I use a calendar and make notes on which days I need to water which plants. The process takes about 10 minutes, once a month, but I’ve been able to keep more plants alive this year than any year previous. It helps to hang the calendar in an inconspicuous place and buy a perky watering can that you will look forward to using. Container gardens are equally nice if you have a little more room to work with. Usually you can stash a pot or two next to your stoop without getting a summons from the city for obstructing the sidewalk. A good rule of thumb is to take a look at what your neighbors have done and devise what you can get away with. Ask your local garden store what sort of plants work best in containers. To avoid people from walking off with your plants and to promote drainage, put a nice layer of heavy rocks in the bottom before you add the dirt and your plant. If you can fit a very large pot, you may even be able to grow some of the smaller ornamental trees and shrubberies. If you’re ambitious and have a decent budget, shutters can add lots of charm. All About Shutters provides a decent repertoire of information for people looking for interior and exterior shutters. Before windows had glass, shutters would offer privacy and protection from the elements. Once glass windows began to be widely used, shutters still provided protection from storms and harsh weather. Today, most people don’t have functional shutters. There are a few things to keep in mind if you want to install shutters on your house. If you are using functional shutters, which are especially nice if you have historic windows with glass panes that may be over 100 years old that need protecting, make sure you measure several times to make sure they’ll fit correctly. If you opt for decorative shutters, make sure you hang them close enough to your windows so that you don’t see a wide gap. They’ll look better if they look like functioning shutters instead of a random attachment. Finally, summer is a great time to make sure the facade of your house is in good condition. No sense making it pretty if it’s falling apart. Inspect your masonry or siding for any evidence of wear or damage. Check your gutters to make sure water flows smoothly. Water can cause quite a bit of damage so you want to make sure it’s going where it needs to.